The agent died by suicide, according to officials. An officer from the Transportation Security Administration jumped to his death from a balcony inside Florida's busiest airport Saturday, creating panic that brought some security checkpoints to a halt for hours, grounded flights and caused serious delays. 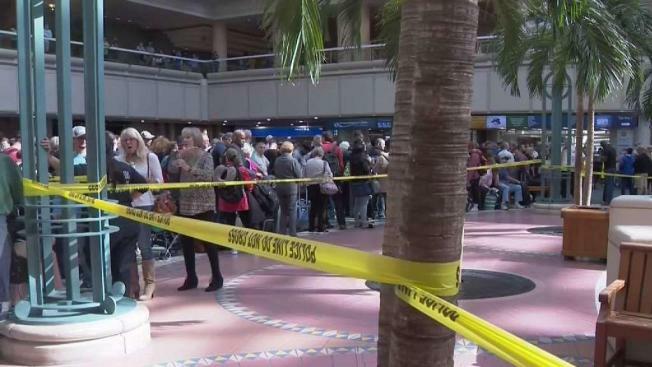 Panicked passengers rushed past checkpoints leading to about half of the gates at Orlando International Airport after the man jumped, resulting in checkpoint closures for up to three hours and some flight cancelations. "At no point were passengers in any danger," airport officials said in a statement. "This is a peak travel time on Saturdays and two of our busiest airlines were affected, Southwest and Delta, so a couple of thousand passengers may have been affected," Carolyn Fennell, the airport's senior director of public affairs, said in an email. "Our hearts are with the TSA family during this very difficult time," the department tweeted. "We ask that you have patience with airport personnel as they work through this tragic incident," the Orlando Police Department tweeted. Rep. Darren Soto, D-Fla., noted in a tweet that the officer's death comes after TSA employees struggled through a partial government shutdown. Along with other government workers, TSA officers worked without pay during the 35-day shutdown. "Our @TSA Officers have already suffered so much during the #GovernmentShutdown," Soto tweeted. "This apparent suicide only adds to tragedy experienced at Orlando Int'l."